Having a high quality camping cooler is one of the best things you can do if you plan on getting out into the wilderness. Whether you’re on your own, with friends, or with loved ones, having a cooler will keep your food and drinks at the right temperature. You don’t just need a good cooler when camping, either. You can take one on a picnic with you, or even having one to take out into the garden with you on a nice day is beneficial. Some people who work outdoors in hot climates may need a cooler to remain hydrated and energized. Coolers are an essential part of your camping gear. In this guide, we’re going to review the best coolers for camping. You’ll get an idea of what to buy and what not to buy, so lets get on with these 5 ice chest reviews. This cooler comes in three attractive colors; white, blue, and beige. It can hold up to 20 cans, keeping them cool with the equivalent of 3 inches of permafrost insulation. 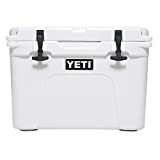 Users have reported that the Yeti Tundra 35 can keep drinks and food cold for 3-4 days on the same ice even when in full sun. This makes it perfect for outdoor workers, fishermen and campers. The performance and durability is mainly down to the thick armored rotomolded construction. Other refinements like the The T-Rex lid latches made of heavy duty rubber are also major plus points. The cooler as a whole weighs 17 pounds, not the lightest but even when full it isn’t too heavy to carry, for one person. 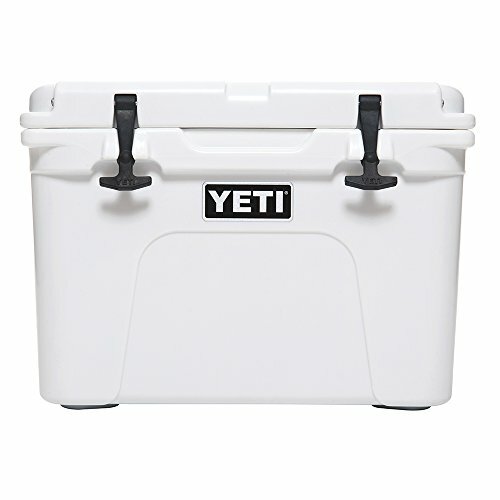 The Yeti Tundra range is one that started many of the modern refinements to coolers off. It’s one of the best ice chests on the market today and the numerous positive reviews speak for themselves. The only major criticism is the price. Yeti is an expensive brand. So can we get the same level of performance and durability from a cheaper more value for money product? 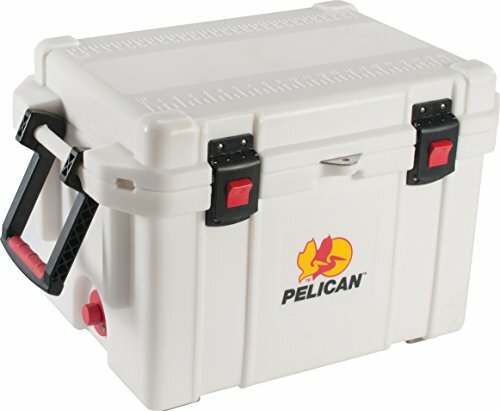 The Pelican cooler has a dual handle system, and comes in a variety of attractive colors including pink, blue, green, red, and more. We love the latches that we could open even with gloves on and it’s fair to say that this baby is almost military grade in terms of construction, certainly as good as the Yeti. The excellent construction however means that the cooler weighs in at a hefty 32 pounds, one of the heaviest on the list. Once it’s filled with ice and drinks it’s a struggle for one person to carry any great distance. If you only have to move from the car to the campground though, this is not an issue. The external drain plug is also really handy. You can drain the cooler without opening the main lid. It’s also great for cleaning especially if you’ve been storing meat or fish and need to rid the unit of any nasty smells or stains. 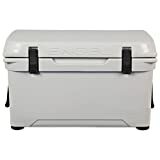 The Pelican ProGear is a very good cooler, with a solid build and does what it says on the tin. Customer reports of ice lasting between 5-10 days and keeping beverages cold is great news for campers and those working out in the sun. However, as it’s so heavy, we can’t help thinking that it would be much better with wheels or even just one wheel to make transportation easier from place to place. With an Engel cooler, you get Neutral colored options, ensuring you blend in seamlessly with the environment around you. 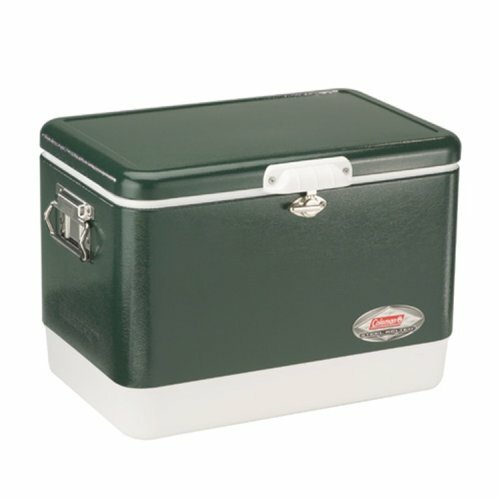 This could make it a great cooler for somebody who is outdoors a lot, maybe a fisherman. At 14 pounds it’s one of the lightest coolers on the list, making it pretty easy to take with you wherever you go. This is an OK cooler, but it performs better at keeping things cold, rather than frozen. It may not be as sturdy as other models either, although it’s fairly easy to carry. If you’re a clean freak, then you don’t want to get the white version, as the stains and marks will annoy you when you find you struggle to remove them. The cooler can break after prolonged use too, which is not what you want to hear when you’re spending good money on an ice chest. It’s just not as good as other high end ice chests on the market, and you could potentially get a much cheaper cooler to do the same job. This attractive retro style cooler comes in multiple colorways, including black, maroon, orange, green and sky blue. It’s a faithful reproduction of the 1954 original with a few modern tweaks to improve cooling performance. It’s the largest unit on test holding up to 85 cans. Considering that the weight at around 19 pounds is pretty good. Plus the size means if you bring the cooler you’ll always have a place to sit. Budget wise it is the most cost effective cooler reviewed here coming in at approximately half the price of the Yeti. 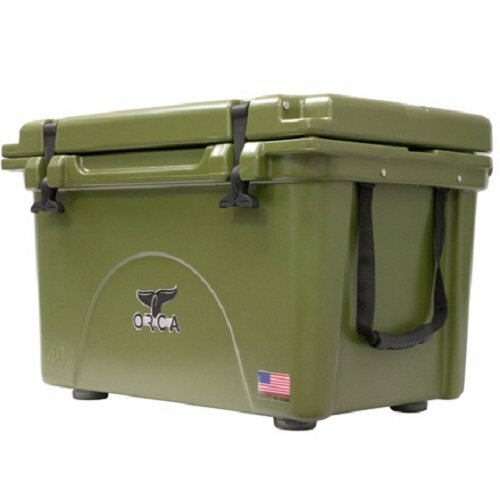 This is a heavy duty cooler that is perfect for those who may be on a budget. With the Coleman, you get excellent value for money. Many agree that this cooler is a brilliant, cheap alternative to a Yeti or an Orca. The cooler may not last as long as other options as there are some concerns about durability. Furthermore it won’t keep things cool quite as well as the best on test here but you can’t complain for the price. Think overnight trip or a tailgate party rather than everyday use when working out in the field or on extended camping trips. The Orca comes in a variety of amazing colorways, including cool contrasting colors such as orange, blue, yellow, red and green like the one reviewed here. If you want to make a statement, then this is the cooler for you. When you spend this kind of money on a cooler though you expect serious cooling capability as well as great looks. The Orca does not disappoint. Users report of great cooling even after 7 days camping. The gasket seal is so good that you often have to undo the drain plug to interrupt the suction formed between the lid and the unit. This is especially true if you change altitudes whilst traveling to the campground. The lifetime warranty also helps to justify the heavy weight price tag, and you can buy the Orca in many different sizes, ranging from 20 quart to 140 quart. The 40 quart test model was a decent 24 pounds in weight, so it’s not too light or too heavy. The Orca is well worth the money for serious campers. Although it is the most expensive option on the list, you get what you pay for with the Orca. If you know you’re going to get a ton of use out of your ice chest, then you couldn’t invest your money in a better chest. Many believe the Orca is better than the Yeti, with both at similar price points and with similar features. Let’s discuss which one we think is best below! Having now read through these ice chest reviews, you might just think you have a good idea of the winner. Due to some of the big names on this review page, the winner may not be so clear to others. The Yeti and Orca brands are two clear contenders for the top spot, but which one of these comes out on top? We think the Orca wins the battle, looking and performing a little better than the Yeti, with the added bonus of a lifetime warranty and being made in America. Yeti coolers are now made in China, and this puts off some buyers, due to quality concerns. However, they are both decent brands – you just get more for your money when you go for the Orca. If you’re on a budget and only want a cooler for occasional use then do consider the Coleman 54-Quart Steel-Belted Cooler. It’s the least expensive on the list, and one of the lightest too given the size. It may not be built as well as an Orca or a Yeti, and may not last years or come with a lifetime warranty, but it’s an incredible, easily affordable option for those with limited funds. 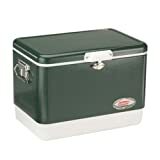 In fact, you’ll find some ice chests on the higher end of the price scale that do not compete with the Coleman. If you’re not looking to spend hundreds of dollars on your cooler, then the retro Coleman is your answer. Is there a cooler you should avoid? 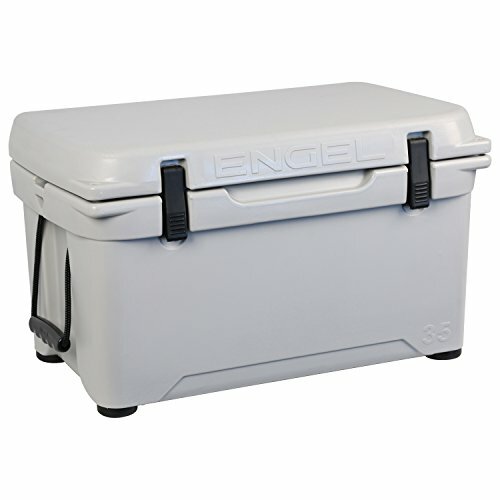 Surprisingly the Engel Cooler is probably the cooler that is best avoided, as it just doesn’t live up to expectation or justify its price. Despite claiming to keep ice for up to 10 days many users claim it struggles to keep it for 2-3 days. You would be better off spending a little more money on a better model or going for a cheaper cooler like the Coleman, as it does a better job. The quality of the Engel simply does not justify the luxury price tag. In summary you can’t go wrong with the Orca or the Coleman these are 2 of the best coolers for camping. If you’re looking for coolers with a little more storage with wheels and handles so you can pull along checkout these models.